Editors Note: This blog has a strict policy agains guest posts, but sometimes you have to relax the rules. My pal Bob stopped by unexpectedly and rather made himself at home. He wrote this. Heya. This here Arizona scenery is more spectacular than Alan let on. Life got a little crazy last week, and I bolted from Malibu, hit the highway they call I-40, and made the turn south at Winslow. So yeah. A big pile of mail as usual last week. Some suspicious letter from the “King of Sweden,” as if. I did open the big envelope from Publishers Clearinghouse, and would you know? I did not win again. But that letter from the King. Yeah. Supposedly I won some kind of noble prize and the King is going to give me a few dollars for it. Bunches of people on the internet got arguing, and my phone would not stop. So I headed for Arizona. To get my head cleared and see some of that long blue sky. Alan was busy building some kind of wood structure out in his driveway, like he is preparing for some mean end of time. I’d think this surreal election is getting to his head. I’ll keep my eye on him. I had me planned a bit more, but some Scottish guy and a psychology lady in the U.K. booted me off the radio, they said it was about “bullets”. And they call us Americans gun crazy! But I will be hanging around Alan’s place a few more days. I might have to share the couch with his dog. But he said Wednesday night might be a good time to light up thar internet radio. We’ll see, I’m just like something the wind blew in. 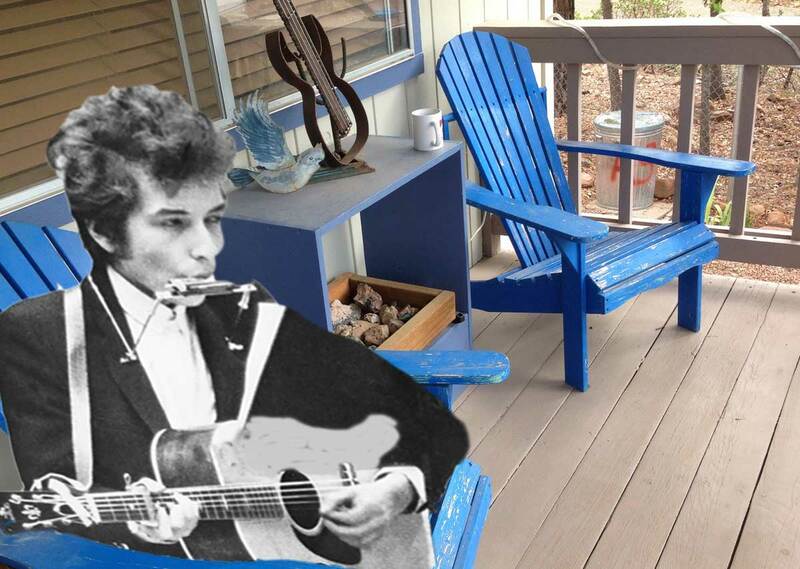 Top / Featured Image: Photo of my back porch with an obvious insertion of some guy name Bob. Very questionable use of his image. I thought he left a hand written permission, but its illegible. So what the heck ARE you building in the driveway and do Peter and I need to order up fancy tin hats from Amazon.com next time we visit? Do you and peter know where I can get a laser beam receiver / reflector?